Moving away from the sun, Mars is the 4th planet of the Solar System. The inspiration for the planet name comes from the Roman god of war. 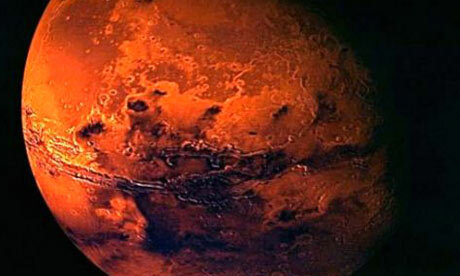 Often it is referred to as the “Red Planet” on account of its reddish appearance. The red color is because of the presence of iron oxide extensively found on its surface. Mars is an earth-like planet having a thin layer of atmosphere. Its surface structure reminds us of certain earthly features such as, the impact craters of the Moon and the valleys, volcanoes, deserts and polar ice caps. In contrast with the Earth, from a geological perspective, Mars is no more an active planet with any tectonic movement as such. The Red Planet harbors Olympus Mons and Valles Marineris, former, the highest mountain in the entire Solar System known to-date and latter, the largest chasm. In the northern hemisphere there is a smooth Borealis basin, may be due to some gigantic impact ever. It covers 40% of the planet. Most interesting features of Mars are that its rotational period and seasonal cycles are similar to those of the Earth. Before the first close view of the Mars taken by Mariner 4 in 1965, scientists believed that there would be liquid water on the surface of the planet. This was largely based on consistent observation of the variations in light and dark spots, specifically in the polar latitudes’ zone, which broadcasted a sea like look, whereas long, dark striations were explained by some expects to be irrigation channels for liquid water. The features based on straight line were later on interpreted as optical illusions. It is strongly believed that of all the solar planets except the Earth, the Mars is most likely to contain liquid water and possible life too. Geological surveys carried out by unmanned missions unravel that Mars one time had large reservoirs of water over its surface in addition to small geyser-like water channels that may have occasioned there in recent past. In the year 2005, radar reports traced the presence of huge amount of water ice at its poles as well as at mid-latitudes as of November 2008. The Phoenix Mars Lander was at length able to collect samples of water ice in shallow soils of the planet on July 31, 2008. The only two moons of the planet, namely, Phobos and Deimos, are of small size and irregular in shape. The moons are suspected to be the asteroids arrested, just like 5261 Eureka, a Martian asteroid. You can easily see the planet Mars from the Earth with naked eye. Its apparent magnitude is ?2.91, a brightness level outshined only by Venus, the Moon, and the Sun, with the exception of the most of times Jupiter will look brighter than Mars. Mars approached as close as 55.7 million km during 2003. Concurrently Mars is hosting three functional satellites, viz. Mars Odyssey, Mars Express, and the Mars Reconnaissance Orbiter. Over its surface there are two Mars Exploration Rovers, namely, Spirit and Opportunity in addition to certain inert landers and rovers, both successful and unsuccessful. The Phoenix lander has recently accomplished its mission on the surface by 2008. Why There is no Life on Moon? Why Our Galaxy is Called the Milky Way?